In the wake of widespread strikes, riots and property destruction by garment workers the employers' federation BGMEA has repeatedly been demanding the government bring in harsher security measures. As their losses run into millions of dollars, the BGMEA has threatened an employers strike if security is not tightened. So now, in the worst affected areas, garment factories are under military occupation, with a permanent presence of huge numbers of police and paramilitary forces deployed to keep workers in the workplace and to force them to do unpaid overtime. This prevents workers leaving when disputes arise and, as normally happens, going to other factories to call out fellow workers. Many workers are more malnourished than ever, as rampant food price inflation continues and garment bosses still refuse to pay a living wage. Factory bosses have officially agreed to sell staple foods to workers at subsidised prices in order to maintain a functioning labour power - but garment unions report that in practice the food is only on sale during working hours, making it unavailable to most workers. Identity cards are also required to purchase the cheap food - and 50% of factories have failed in the legal requirement of issuing them, as ID cards make it easier for workers to claim owed back-pay. The ready made garment (RMG) industry imposes ever-harder exploitation to maintain global competitiveness; its advantage of cheaper labour can be offset by competitors' greater technological investment delivering higher productivity. 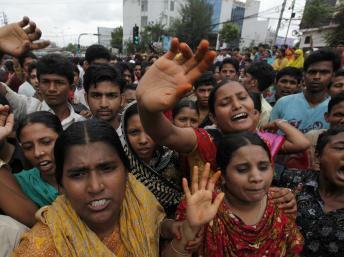 So, to maintain its advantage, Bangladeshi capital often works its labour power to exhaustion. Focussing on the cheaper, less skilled end of the market, and with low start-up costs, it is possible for some Dickensian-type capitalists to fulfill a large RMG order by working the labour force to the limit; 10 to 14 hour days are normal for a workforce that is 90% female and from as young as 12 years old - back wages are often not paid, the workers are dismissed - then the whole process starts again. Workers' malnutrition has become so widespread that some are now reported to be hallucinating in a delirious state during long shifts. A wave of mass hysteria is said to have spread through RMG factories where workers report ghost attacks - hallucinatory experiences based on the symbolism of the prevailing religious and cultural beliefs and superstitions. Psychologists have labelled the 'ghost panic' as 'collective obsessive behaviour' or 'mass sociogenic illness' and attributed it to stress, overwork and malnutrition. The so-called 'ghost panic' in factories first surfaced after a section of workers vandalised Diganto Sweater's factory in Gazipur, following rumours of the deaths of a few workers as a result of 'ghost attack' in a toilet of the factory. Production in the factory remained suspended for four days as workers went on a rampage, damaged factory property and blocked the roads for hours. In May this year, vandalism triggered by ghost phobia forced a factory in the Chittagong Export Processing Zone to suspend production for two days. At least 10 other garment factories have come under attack in the last two months in Gazipur alone after the spread of almost identical news or rumours that workers fainted in factory toilets and some of them even died. The latest incident occurred at Pandora Sweater Factory on the Joydevpur road intersection on September 5, three days after workers vandalised Diganta Sweater and clashed with law enforcers in the same area. Five workers of Diganta Sweater claimed that they saw 'witches' before they fainted inside factory's toilet. They were taken to a nearby clinic where physicians found that none of them had sustained any injury. 'They fainted because of weakness. I found that their blood pressure and heart beat was too low,' said Abdur Rahman, chairman of Sheba Diagnostic Hospital. He said that all the patients were cured after initial medical treatment. The hospital and some 80 other clinics have become used to get patients with such symptoms in Gazipur which has a concentration of apparel factories. He said his hospital treated, on an average, 100 garment factory workers suffering from anxiety-related illness every month. 'Poor garment workers suffer mainly from malnutrition and anxiety, which make them weak and vulnerable to nervous breakdown,' said Rahman. In at least one factory a religious exorcism rite has been performed. One explanation of the 'ghost panic' may lie in the fact that so many reports place the 'sighting' of the apparition in the factory toilets. In the present climate of intense class conflict a worker is surrounded by openly hostile forces in the factory - and only protected by the solidarity and presence of fellow workers. Exhausted and malnutritious, they feel the threatening presence around them even when alone in the toilet - leading to paranoid hallucinations. Also, the toilet is where many actual attacks on workers by factory management and security staff have occurred, so the feelings of vulnerability and paranoia are not without reason. While RMG workers' working and living conditions are undoubtedly bad enough to destroy workers' health, it is hard to gauge the wider truth of these strange events - what may have been true in some factories may have then spread as a running joke among workers (and been swallowed whole by gullible media and doctors always on the lookout for a new phenomena to categorise); an ironic excuse from striking workers smashing up bosses' workplaces - 'It's not our fault - you've driven us mad!'. Dozens of trade unions in the readymade garment (RMG) sector are hardly in any position to resolve recurrent labour unrests, as they have no control over workers at factory level due to inactivity of most workers' unions, observed trade union leaders. According to some leaders, at present there are more than 28 registered trade unions and more than 13 unregistered trade unions in the RMG sector. Of the 200 registered workers' union units at factory level, only 15 or so are active, the trade union leaders claimed. As a result, the central trade union leaders do not have any proper means of intervention in the wake of any labour unrest, although the leaders are meant to play a major role in resolving labour unrest. During the recent incidents of unrest, garment workers attacked many factories, but the trade union leaders could not communicate with the workers due to the absence of active workers' union units. It is embarrassing for the garment worker unions to have to admit their lack of control over the workforce they officially claim to represent. It is a plea to garment bosses and government to allow a greater role for unions in industrial relations as a restraining influence on workers' combativity. But the majority of the Bangladeshi ruling class so far remains unconvinced that unions can be an asset to them, though a liberal minority can see their potential value as a stabilising influence. (The eagerness of these self-appointed union 'leaders' to always speak in the name of workers who have little interest in them was previously described in our earlier report.) Since the present wave of troubles began, the Government has relaxed some of its restrictions on union activity. Quamrul Ahsan, secretary of the Bangladesh Garment Sramik Karmachari Federation, pointed to the fact that leadership has not emerged among workers at factory level because trade unionism in the form of workers' union are limited for various reasons. "When any unrest occurs at any factory, all workers try to take up the leadership on the negotiation table, which, most of the time, leads to disputes being unresolved,” he went on. "We didn't have enough food before Ramadan anyway. For us, it's the same," ... "For the poor, it's always Ramadan." One wonders just where this situation will lead - Ramadan (a period of dawn to dusk religious fasting and abstinence) ends in a few days and people will pour out into the streets, and this has previously been a spark for outbreaks of rioting. So far, the RMG industry, the most important sector of the Bangladeshi economy, has not been seriously hit by the effects of the emerging global recession; although the workers unrest has cost millions in property damage and production stoppages, orders are still reported to be at a high level. Maybe sellers of cheap goods will ride the downturn better than at the higher end of the market. But when, inevitably, the recession starts to bite, one wonders what room is left - short of imposing actual slavery - for any further austerity measures to inflict on garment workers. Certainly, a situation of militarised factories inhabited by malnourished, half starving wage slaves worked to exhaustion - yet still bravely maintaining a high level of autonomous class struggle outside of any union control - is both a grim reminder (for Westerners) of the underside of modern global consumer capitalism and also a pointer to where some of its possible weaknesses lie.